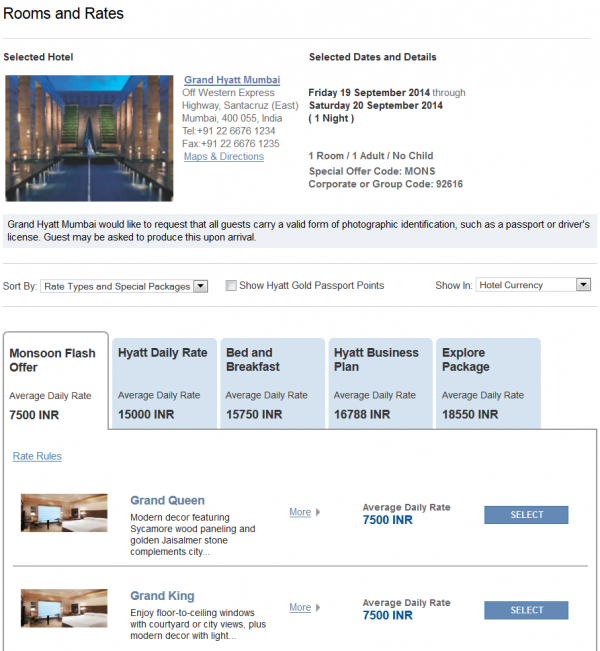 Hyatt has started a 50% off “Monsoon Flash” sale for stays in India between August 1 – October 31 and December 16, 2014 – January 10, 2015. You must book between August 1-15. The sale is to celebrate Hyatt’s 31 years of hospitality and 19 hotels in India. The sale rate for a September weekend night is only $78 before taxes. 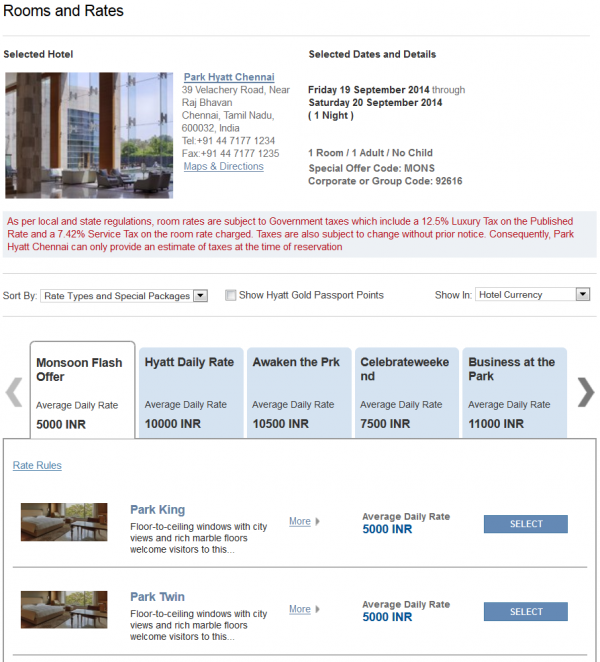 The Park Hyatt Chennai weekend rate in September is only $82. The weekend night at the Grand Hyatt Mumbai sets you back $123. This seems to be a genuine offer that lowers the daily rates by 50%. There are some very cheap Hyatt hotels to be had under this rate plan in India. Offer valid for all 19 Hotels Across India. Book Between August 1, 2014 at 00:00 hours Indian Standard Time to August 15, 2014 23:59 hours Indian Standard Time for Stays from August 1, 2014 to January 10, 2015. With black out dates from 1st November 2014 to 15th December 2014. and reward your self with 50% off on Hyatt Daily Rate. Savings reflected in rate at time of booking. All hotel reservations are subject to availability and must be made in advance. The Offer is Non- Refundable/full prepayment and no date changes or Name changes are allowed. Offer is not valid with groups/conventions and may not be combined with other promotional offers. Package inclusions as listed. Rate is per room, per night, based on single occupancy. Additional charges apply to room-type upgrades. Additional guests may be subject to additional hotel charges. No refunds for any unused portion of package.